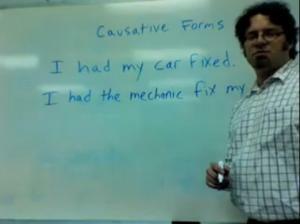 How to Use Causatives in English. 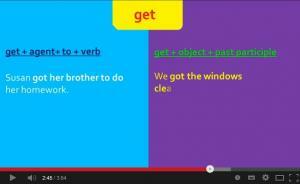 Learn how to use the verbs "get", "have", "make" and "let". A good introduction to basic causative verbs, "make", "let", "go..to" and "have". An excellent video lesson on the use of causative verbs 'to have (something done)' and 'to get (something done)'. The teacher goes through examples very clearly, using a marker on the slides so you can always see where you are in the lesson. There are test sentences at the end to check your understanding, which the teacher then goes through with you. 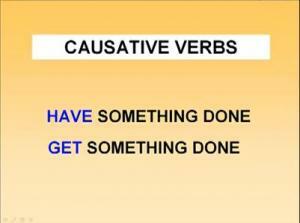 The causative is a common structure in English. It is used when one thing or person causes another thing or person to do something. This page will explain how causatives are formed, and how to use them. There are several exercises for practice. The exercise answers are available, if you can't seem to get a question right. How to use the causative. A detailed video lesson that goes through all the uses and meaning of the causative (have/ get something done). The teacher is very clear and goes through everything at a good pace for students to follow and understand. explains how to use the verb "have" in the causative form. This is similar to the passive voice. 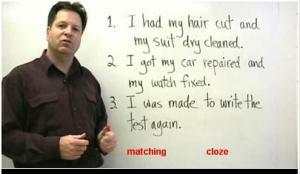 This lesson explains how to use the verbs "get," "had" and "make" in causative sentences. That is, when you cause something to happen by request or by force. An excellent resource for students who enjoy learning grammar details. There are also two exercises for you to complete after watching the video. Learn about the causative, and how to use “have” and “get” when talking about actions that were performed for you or to you, in this grammar lesson. 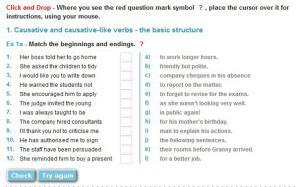 Movie Segments to Assess Grammar Goals contains a series of movie segments and activities to assess or practice grammar points through fun, challenging exercises. Look at this clip from the classic comedy, The Money Pit. There is also a lesson plan, printable worksheets with an answer key for each activity, and tips to develop your own grammar activities. 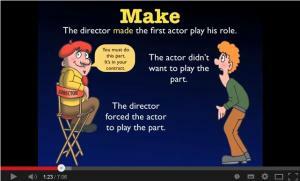 It is excellent for practicing causative verbs - make, let, get, have. What is the difference between someone making you do something and someone having you do something? Is it correct to say “He made me clean my room” or “He made me to clean my room”? 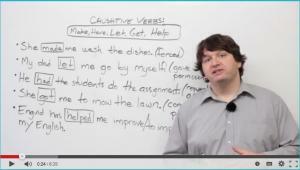 In this lesson, I look at a very common active causative verb structure with the verbs make, have, let, get, and help. 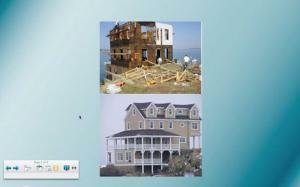 Check out the lesson and check your understanding with the quiz. Watch the slide show and see all the causative verbs (make, get, have.has,cause,let,help) and their forms when using with and without an agent. 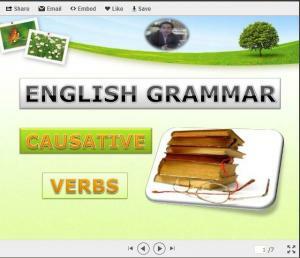 The term causative verb is not used very much in EFL teaching. But it does start to appear when you get to certificate exam levels, when it refers almost exclusively to that same 'have something done' construction. This is a great site that goes through what constitutes a causative verb and how many of them there are! There are lots of practice quizzes / exercises.